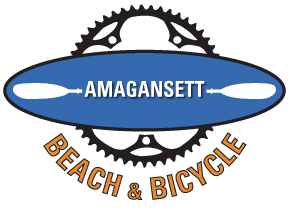 Since 1996, Amagansett Beach & Bicycle has been your full service bike, kayak, paddle board and beach shop. We are just a short bike ride to the most beautiful beaches in the Hamptons. Whether you call the East End home or are just visiting you can find everything you need to enjoy the outdoor activities the East End has to offer. Bike, kayak, surf, paddle board or beach accessories ... we have you covered. Our expert bike mechanics are here to do on the spot repairs or you can leave your bike with us for a tune up and you’ll be back on the road in no time. If you need a new bike... check out the latest from Cannondale-road bikes, hybrids, mountain bikes are all in stock. Looking for the ultimate chic ride? Bikes from Linus will set you apart from the crowd. These bikes are fun to ride and fashionable - no spandex racing attire needed. Get on the water! It’s what the Hamptons are really about. Kayaks from Hurricane and Feel Free and paddle boards from Bote, Surftech and Pulse offer the latest technology and design so you can enjoy the tranquility of the nearby bays and harbors or a thrilling session in the surf. Here for a visit? We rent all types of bikes, kayaks, paddle boards and surfboards. You can even book your rental online on our website! Let Amagansett Beach & Bicycle help you explore the natural beauty of the East End... because EVERYTHING IS BETTER AT THE BEACH! I love this place, when I needed my daughters bike repaired, Lee Oldak picked up my bike from my house in Sag Harbor fixed it and returned it back to my home. They sell everything Kayaks, bikes, surfboards. If you are visiting the Hamptons and you don't want to bring your bike, no worries Amagansett Beach and Bicycle does not only rent bikes but they deliver and pick-up as well. You can trade your old bikes in for credit towards a new bike.